Adobo refers to a method of marinating and stewing for any cut of meat or fish in a briny mixture of vinegar, soy sauce, and spices. Filipino adobo should not be confused with the spicy Spanish adobo sauce. Although they both share the Spanish name, they are vastly different in flavor and ingredients. This cooking method, like most of Filipino culture, is of mixed heritage. While not official, many consider chicken adobo to be the national dish of the Philippines. There are many regional varieties of adobo, but most recipes include vinegar, soy sauce, garlic, bay leaves, and black pepper. The meat is marinated and then stewed in this mixture, which yields a very flavorful, tangy, and tender meat. 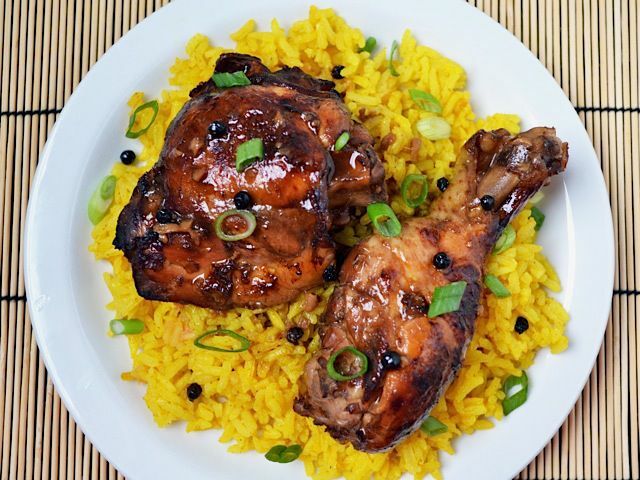 Adobo is usually served over a bed of fluffy rice to absorb the deliciously tangy sauce. Like many cultures based in warm climates, Filipino natives developed various methods of preserving food. Adobo utilizes the acid in the vinegar and the high salt content of soy sauce to produce an undesirable environment for bacteria. Its delicious flavor and preserving qualities served to increase adobo's popularity. The adobo was traditionally cooked in clay pots but today is made in more common metal pots or woks. When the Spanish invaded and settled in the Philippines during the 16th century, they witnessed this traditional Filipino cooking method and called it adobo, which is the Spanish word for marinade. Although there are basic adobo ingredients, you may find other ingredients that have been included. Vinegar and soy sauce are the heart of adobo, but over the centuries, other liquids have occasionally been added to the brine. Some varieties include coconut milk, which mellows the strong flavors of the vinegar and soy sauce. Others include sugar or honey to add a touch of sweetness and an almost teriyaki-like characteristic. The flavor of adobo can also be varied depending on the type of vinegar used. In the Philippines, coconut vinegar, rice vinegar, or cane vinegar are the most common. Most basic adobo recipes are seasoned only with garlic, bay leaf, and black pepper (the peppercorns can be left whole or crushed for a more vibrant flavor), but additional seasonings may include ginger, onions, or other vegetables. And it is not just the brine that can vary—all different kinds of meat can be part of an adobe. Although chicken adobo is the most well known, adobo can be made with pork, beef, fish, or other types of meat. Although not required, the meat is often fried after stewing to give it a crispy exterior. There are as many varieties of adobo as there are cooks in the Philippines. Although the country is small, the popularity and reach of adobo have spread throughout the world. Even though the adobo marinade can vary from region to region—and cook to cook—some adobo dishes are made more often than others, like chicken, pork, and beef. When chicken is the meat of choice, it is called adobong manok, and the dish adobong baboy includes pork. Adobong baka is beef adobo. What is Pancit Guisado? How Many Variants Are There?